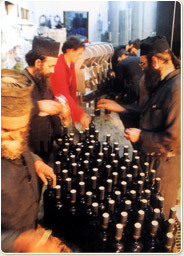 For more than a thousand years, since the time of Saint Athanasiou, the grapes of the Mylopotamos vineyards have produced multiply-blessed communion wine, as much blessed in its use in Holy Communion as in its ability to warm the soul. In this miraculous and saintly place many varieties thrive, albeit due to the hard labour of human hands. With such happy results, each fatigue is soon forgotten. Saint Athanasios was sensitive to the special character of Mylopotamos and, apart from seeing to the vineyard’s construction, ensured that the monastery also became a place of comfort and restoration for the monks who sometimes suffered from their labours. For more information about Mylopotamos please visit www.mylopotamos.com. To sum up, it is worth mentioning that Mylopotamos wines are a product of biological agriculture, certified by the branch of ministry of agriculture in Chalkidiki, as well as by the company certification of biological products D.H.O.